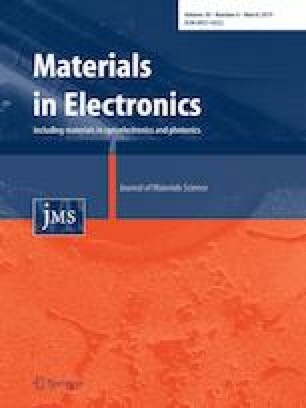 In this study, tin-doped indium oxide (ITO) thin films with composition of 10% SnO2 and 90% In2O3 have been produced onto glass, polyethylene terephthalate (PET) and Silicon (Si) substrates by using thermionic vacuum arc technique. The properties of the ITO thin films were determined various tolls such as an X-ray diffraction (XRD), ultraviolet–visible (UV–Vis) spectrophotometer, optical reflectometer, field emission electron microscopy (FESEM), atomic force microscopy, four-point probe and contact angle (CA) measurements devices. According to the XRD patterns, deposited thin films onto glass, PET and Si substrate are in amorphous structure. The thicknesses of the deposited layers are very close to each other’s and films. The transmittance values are approximately 30% at 632 nm. Refractive index of the deposited layers are close to 1.75, but optical band gaps are found 3.88 and 3.81 eV for the thin film deposited onto glass and PET substrate, respectively. These values are bigger than the value of the band gap value of the ITO material. In surface analysis, it was found that crystallite dimensions are in nano-scales. According to surface analysis, nano-crystalline ITO thin films were deposited. The contact angle of the coated ITO layer were measured in the range of 98°–110°. The electrical resistivity of films was calculated about 0.65 × 10−5 Ω cm for ITO/glass, 1.05 × 10−5 Ω cm for ITO/PET and 5.82 × 10−5 Ω cm for ITO/Si.